I LOVE hosting dinner parties. I’m a huge advocate for doing life around the table, surrounded by great people and delicious food. That’s where real life happens, and where you have the most meaningful, life-giving conversations. Healing happens around the table. I’m all about taking it slow and lingering at the table - letting conversation wander all over the place. Hanging around long enough to get the munchies again. The more courses, the better. Italians do this really well. Five years ago I spent 3 months in Italy with my best friend (who also loves food and loves to host). Their value for lingering around the table and slow pace of life marked me forever. My time there taught me that doing life around the table is beautiful, messy, intensely vulnerable, and something worth investing in and protecting. I think we’re getting a little better at slowing down and lingering around the table here in America - Nashville alone has plenty of Italian-inspired restaurants that offer shareable plates and family-style dishes that encourage lingering. Rolf & Daughters and City House being two of my favorites! But in our fast-paced culture, I think we could all do with being a little more intentional at slowing down and connecting with good people over a delicious meal. I think if more of us would just slow down and sit across the table with each other, maybe we'd experience a lot less division in our culture. Agreeing with someone is not a prerequisite for sharing a meal with them. Or at least it shouldn't be. It's really easy to make inflammatory statements or to get offended or riled up on social media. There is no explanation and no way to hear the heart behind someone's posts or comments. It's only when you sit down with people and commit to listening and learning from one another, regardless of whether or not we agree with them, that we grow. That we connect. That we can agree to disagree and it doesn't mean the end of our friendship. I don't know how or why we've lost that - but it's becoming increasingly popular to completely reject people with different opinions than us. I don't know where we started believing that we all should have the same opinions. Or having the audacity to think that anyone that doesn't share our opinion is wrong or lesser than us. The goal shouldn't be to agree with everyone. The goal should be to love and respect each other either way. No matter your political ideas or leanings. That's how cultures change. Healing happens around the table. I want to share some tips and tricks I’ve learned along the way to help you create a beautiful environment for you and your friends to connect over delicious food, and to help you think outside the box as you plan and prepare! To prove that you can do life around the table and host gorgeous dinner parties, regardless of where you live or your skills in the kitchen. Before we get into it, though, I want you to know that all you need for doing life around the table is your people and some kind of food. Snacks even. A loaf of bread. It doesn’t have to be fancy. Or even pretty. You really don’t even have to have a table! Aesthetic isn’t the point, but it can add to the atmosphere - the space that you’re creating for you and your friends to connect in. Cultivating a beautiful, peaceful environment that my guests can feel at ease in and inspired by is one of my favorite parts of hosting! Aesthetic isn’t the point, but it can add to the atmosphere - the space that you’re creating for you and your friends to connect in. My birthday is in early July. While trying to figure out what to do for my birthday this year, I realized that all I wanted to do was to host a beautiful dinner party with some of my friends. I spent a lot of time trying to figure out where I could host it. We live in an 850 sq. ft. apartment, so hosting more than 2 or 3 people at a time gets pretty cramped. I thought about asking a friend if I could use their house, or just braving the heat and trying to do a big picnic outside at Arrington Vineyards. It's one of my favorite places, but no one wants to be out in the humidity and heat that long in the middle of summer in Tennessee. But then I had a thought - what if I didn’t have to wait to host beautiful dinner parties until we moved into a house? What if I could get super creative with the space we have now? I still wouldn’t be able to invite as many people as I would’ve liked to, but I became determined to prove to myself that I could make it work with what we had. So we cleared out our living room space (the biggest room in the apartment) by putting the TV and chairs and coffee table in our creative room, and pushing our couch up against the wall. We bought a 6 foot folding table and tablecloth, and then I borrowed everything else I needed. We got married only a year ago, so I’m still in the process of acquiring dreamy hosting things. I borrowed extra chairs, cloth napkins, wine and water glasses, cheese plates and platters, bowls, and carafes from a couple of my friends who also love hosting. I chose to do a wine and cheese night - first of all, because we were on the keto diet at the time I was planning it, and secondly, it required the least amount of dishes and was SUPER easy to throw together. Also - Italy. Duh. We set the table up in our living room, right in front of our big window to get the most natural light, and used our normal dining table to prep the food. I was so excited that I spent most of the day piddling around figuring out how I wanted to set the table. I’d invited 6 of my friends to come over the night of my birthday to celebrate with us. I didn’t want to push it and risk it feeling crowded, so I stuck with a smaller number of some of my favorite people - interestingly enough, all of whom I've traveled to at least one other country with! And the night was PERFECT! We lingered around the table for hours chatting and laughing and retelling stories over delicious foods and bottles of wine. Everything was so dreamy! It was all that I’d hoped for and more. I felt so loved and I got to do my favorite thing in the world on my birthday. And I almost cheated myself out of it by thinking that our space wasn’t conducive to hosting bigger dinner parties! All it took was getting a little creative with our space and the resources we had. Having trouble figuring out how to style your dinner party or just need some ideas on where to start or inspiration for around the table vibes? My favorite place to look for inspiration is Pinterest. Check out my Around the Table board for all kinds of table settings, dinner party vibes, and out of the box ideas! In Italian culture, you can have up to 5 courses in a normal, every day dinner! First you have your antipasto, which means “before the meal”. It’s just a little something to nibble on, like crostini or bruschetta. Then you have the primo, which is an appetizer. In Italy, pasta is not a main course - it’s an appetizer! Then you have the secondo, which is the main course. This usually consists of chicken, meat or fish. They are small portions and are usually pretty simple. Then you have the contorno, which is a platter of vegetables that is usually served with the main course. And then, of course, you have the dolce, or dessert. This is my favorite way to enjoy a meal with friends... if I'm not the one cooking. However, if I'm hosting, I try to minimize the amount of time that I have to be in the kitchen during the meal, so I usually opt out of having lots of different courses that come out at different times. Instead, I try to come up with meals that are easy to linger over. Or I just pile tons of food on the table and let everyone graze as long as they want. Your menu doesn’t have to be complicated. As much as I love going all-out on a menu, my goal is always to spend as much time as possible with the people I love! Cheese plates + Charcuterie Boards are my FAVORITE. They are incredibly easy to prepare, there is very little planning involved, and is perfect for munching and lingering! Taco Nights are always a crowd pleaser and are super easy to throw together! Click here for everything you need for an epic taco night with friends! Ramen Bowls are perfect for a chilly day when you need comfort food. It’s an all-hands-on-deck kind of dish, so it can be a super fun date night or double date activity! I usually reserve these for smaller groups, but I have made them for a dozen people on a couple of occasions. Just make sure you have helpers! I love getting people into the kitchen with me! Brunch is always a fun way to connect and hang out in the morning or on the weekend! (It’s also the perfect excuse to indulge in a brunch beverage!) It can be as simple as eggs, bacon, and avocado toast, or it can be a smorgasbord of all of your favorite breakfast foods. Think French toast, crisp, pancakes, quiche, biscuits, sautéed kale and eggs and bacon, omelettes, croissants, donuts, fruit, scones, coffee, mimosas... I could go all day. Sheet pan meals including chicken, carrots, potatoes and any other veggies are always a winner in my book. They're delicious, easy, good for you, and require very little cleanup. What you drink obviously depends on your menu. I wouldn't want to drink a margarita with a cheese and charcuterie board - or really anything other than wine. Just like I wouldn't drink coffee with chili. Eww. So be intentional with what you decide to pair with your menu! My favorite place to pick up a bottle of wine is Woodland Wine Merchant in East Nashville. I’m really into natural wines right now, and they have a great selection and the staff is super helpful in pointing me in the right direction and recommending some good options! I don’t know a ton about natural wines yet, so I need all the help I can get! Also, their store is beautiful! They also have a great selection of beer and liquor. If I just need to pick up liquor, I head to Frugal MacDoogal over in the Gulch - they have the best prices around! If you're doing brunch, or just need an after meal pick-me-up, you'll also need coffee. We get our coffee through a subscription with Four Barrel Coffee out in California. We get a bag delivered to our doorstep every week - praise the Lord. But if we're running low because we've had people over during the week, we'll walk down and grab a bag from Revelator down the street, or swing by Crema or Barista Parlor. Flowers and/or greenery can add that little something that brings your spread together. I frequent Amelia’s Flower Truck for pretty much all of my hosting + dinner party needs. There are three trucks that are usually parked in three different spots around Nashville, and all I have to do is check their Instagram to see where they are on any given day! It’s the cutest thing ever, AND they are super affordable! They always have several different types of greenery and all kinds of flowers! I love being able to create my own bouquet because I love simple, neutral colors. Also it’s just fun! But if you need some help figuring it out, they are super helpful and will even create one for you if you want! (Guys - this is the BEST place to pick up some blooms for that special someone!) Depending on the season and what I’m doing, I’ll sometimes just get greenery. They usually have several different kinds of eucalyptus available, which is often all you need! I also love to forage for greenery and other plants around my neighborhood for table settings and styled photoshoots. It's fun, it gets me outside, and it's free! Music can help set the tone of your dinner party. I try to pick something that’s low key and won’t distract from conversation. Most of the time it just depends on what mood I’m in, but I usually go for something instrumental. This Italian-inspired, instrumental playlist is my go-to! If we’re having a taco night, I’ll throw on a playlist with Rodrigo y Gabriela. Sometimes I throw on some Frank Sinatra or Jazz when I’m hosting a Fall dinner party. Don’t have time to create your own playlist? Create a station on Spotify using one of your favorite artists and let it do all the work for you! You know - Framily. Friends who are close enough to be family. Pajama Friends. People that you don’t mind seeing you in your pajamas or without makeup on. The ones that you’re okay coming over uninvited or on a whim - regardless of the state of your kitchen. These are smaller, more intimate gatherings and they are my absolute FAVORITE. And then you have larger gatherings that include more than just your pajama friends. They’re still your tribe all the same, but these bigger gatherings will probably involve a little more planning than a smaller group. Or maybe you’re getting to know some new friends! Or even having family over! Like I mentioned before, you can get really creative with where you choose to host a dinner party! I believe there is something especially beautiful and intimate about hosting people in your own home, but I also LOVE thinking outside the box. Think along the lines of on a boat dock, or on the beach or by a lake, or in a vineyard or a field, or your very own backyard! If you have a blanket or a portable table and chairs, you can pretty much take your dinner party anywhere! Obviously you have to take into account what foods you're planning on serving, because if you need to be close to a kitchen or need to keep things hot, you can't go too remote. My husband just bought me Food52's Table in a Bag for my birthday, so I can take my picnic literally anywhere! My favorite place to plan larger gatherings right now is Arrington Vineyards - early Spring and late Fall are my favorite times to picnic with a bunch of friends. They have picnic tables everywhere that are easily moved so you can put them together for bigger groups! It’s just a little outside of Nashville, so it feels like I’m in a completely different place. And it’s the closest I can get to being back in Italy without leaving the state! 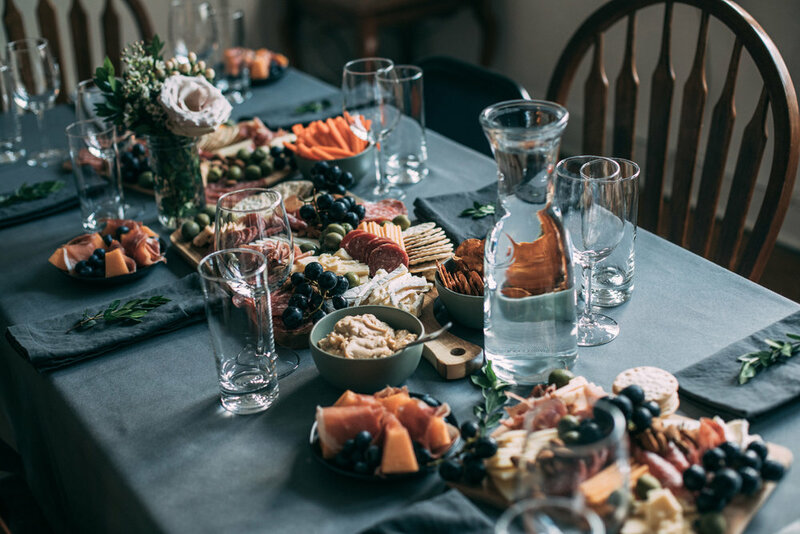 When looking for inspiration and planning your gathering, consider the season you're in and filter decisions regarding the rest of these categories accordingly! This will help you make smart, intentional decisions each step of the way. If it's the middle of summer, you might want to avoid having a meal outdoors in the middle of the day - unless you're really into sweating, that is. While I will eat tacos no matter the season, some things should really be left to their respective seasons. For example, I'm probably not going to want to eat a hot bowl of soup when it's 100 degrees outside. Similarly, I'm not going to want to drink an ice cold beverage when it's frigid outdoors. What kinds of foods are in season? Are you hosting something in the fall? If so, consider preparing something hearty to eat. Or use pumpkins or butternut squash as inspiration for both your meal and decoration for the table! Is it Winter? Forage for evergreen tree branches and wild berries to intersperse around the table for decoration. There are always fun things to forage outdoors for decorations in every season! Pine cones, leaves, berries, branches, wild flowers. Each season brings with it a unique kind of beauty - I love mining each one for all that it offers while it lasts! Doing life around the table is an art form. You can be as creative as you want to be. It can be as simple or as ornate as you desire. It is intensely personal and you have complete freedom to make it whatever you want to be. But most importantly, doing life around the table is brave. It is vulnerable. It is worthwhile. It is important.